Before A Literary History of Reconciliation, I wrote two books on Renaissance literature and culture, the last one on Renaissance understandings of physical pain. For a new book project, I wanted to venture beyond the early modern period and look at a longer timespan. Also, after a whole book on suffering and agony, I wanted to write on a more upbeat topic. ‘Reconciliation’ seemed perfect: how do people resolve their conflicts, and what do works of literature have to say about this? I vaguely hoped to be able to say something uplifting about these questions. But I increasingly came to realize that conflict resolution, as imagined by literary authors, is often a far from happy affair: even in the most intimate spheres, reconciliation is fundamentally bound up with power relations and hierarchies. The ways in which we reconcile often serve to confirm and perpetuate dominant power relations and hierarchies – between generations, genders, classes and races. We find an illuminating example of this in Charles Dickens’ novel Dombey and Son (1846–48). Approximately two thirds into this novel, Mr Dombey’s second wife Edith Granger elopes with his ruthless business manager James Carker. Enraged, Dombey goes looking for her, determined to beat ‘all trace of beauty out of the triumphant face with his bare hand’. But Edith is gone, and Dombey instead strikes his daughter Florence, whom he encounters on the staircase, as a stand-in for Edith, and tells her to leave his house. Years later, Florence returns to her father’s house and, in a moment that has baffled many readers, asks for his forgiveness: ‘Papa! Dearest Papa! Pardon me, forgive me! I have come back to ask forgiveness on my knees. I never can be happy more, without it!’ A little bit later, Dombey does acknowledge that he has wronged Florence and asks to be forgiven: ‘As she clung closer to him, in another burst of tears, he kissed her on her lips, and, lifting up his eyes, said, “Oh my God, forgive me, for I need it very much!”’. What has Edith done wrong? The novel as a whole suggests that her crime consists in the fact that she left her father’s house after he struck her and told her to, well, leave his house. In doing so, she made publicly visible his dysfunctionality as a patriarch, and withheld from him his rightful status as a father. She can only remedy this by asking humbly for Dombey’s forgiveness, in this way reacknowledging his patriarchal authority. It is only after she has done so, moreover, that Dombey acknowledges his own guilt, and he does so only before God, not directly to his daughter. This Dickensian reconciliation scene ensures that patriarchal power is reestablished – and that even an abusive father is forgiven in such a way as to leave his paternal authority intact. Central to this scene is a vocabulary of Christian forgiveness, and one question which my book examines is how this vocabulary – theological in origin – serves to legitimize power relations by wrapping them in a spiritual veneer. That this is also true today (and outside the realm of literature) is suggested by the response to Donald Trump’s infamous Access Hollywood tapes by prominent American Evangelical leaders. In an interview on CNN, Jerry Falwell Jr., the President of Liberty University, said that ‘we’re all sinners, nobody understands that better than Evangelicals…we believe we all need forgiveness.’ Such spontaneous, generous, Christian forgiveness is extended with especial enthusiasm to powerful, wealthy, white, heterosexual men. By contrast, Evangelical views on sexual ‘purity’ for women, or on gay marriage, are considerably less forgiving. Forgiveness, in other words, is deeply ideological. Jan Frans van Dijkhuizen is Associate Professor of English Literature at the University of Leiden, the Netherlands. His previous books include Pain and Compassion in Early Modern English Literature and Culture (2012) and Devil Theatre: Demonic Possession and Exorcism in English Renaissance Drama(2007). 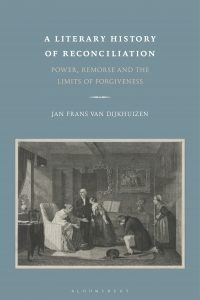 His latest book, A Literary History of Reconciliation: Power, Remorse and the Limits of Forgiveness, is now available from Bloomsbury.